On December 2nd 1983, Michael Jackson's Thriller premiered on MTV, revolutionising music videos and securing Michael's place in history as the pioneer of a new art form. No other music short film has generated such excitement and has grasped our attention so intently that more than three and a half decades later, we still share it as a collective memory. One historian, Joe Vogel wrote, "Thriller is the Citizen Kane of short films." Michael Jackson's Thriller remains the only music video to be inducted into the elite National Film Registry of the Library of Congress. After breaking down the barriers of MTV with "Billie Jean" and "Beat It", Michael further revolutionised music video production with this epic 14-minute film shot on 35mm film, legitimising it as an entirely new art form. The landmark short film went on to win three MTV Awards, two AMAs and a Grammy and has 722 million combined YouTube views. Michael Jackson's Thriller was written by John Landis and Michael Jackson and directed by Landis, and was filmed in and around Los Angeles in October 1983. Michael's friends Marlon Brando, Fred Astaire, Rock Hudson and Jackie Kennedy Onassis all visited the set. 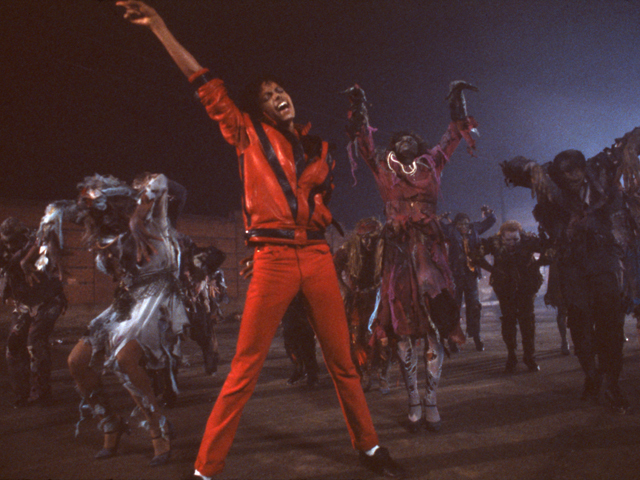 The song 'Thriller' is from the album Thriller, the biggest selling studio album of all time. 'Thriller' was the 7th and final single from the album, and the short film sent album sales into orbit. A perpetual favourite, the Thriller album has gone 13 x Platinum in Australia, with the single reaching 3 x Platinum. At a private first showing in November '83, wrote Vanity Fair, "The A-list turned out … at the 500-seat historic Crest Theatre: Diana Ross, Warren Beatty, Prince, and Eddie Murphy. Fourteen minutes after it began, the crowd was on its feet, applauding and crying, "Encore! Encore!" Eddie Murphy shouted, "Show the goddamn thing again!" And they did." Michael Jackson's THRILLER 3D premiered at the Venice Film Festival in 2016 and became the first music video released in IMAX 3D in September this year.